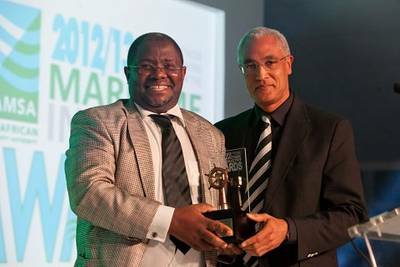 Durban's Wabona Group was among the winners in one of the nine award categories, during a Maritime Industry Awards function held on April 28, 2013 in Cape Town. The event, held to celebrate contributions to the South African Maritime Industry, was a culmination of a nationwide nomination process. Wabona Group was awarded a Maritime Newcomer accolade at the 2012/2013 Maritime Industry Awards, Organized by Colleen Jacka of Maritime Review Africa. The South African Maritime Safety Authority (SAMSA), in collaboration with key industry partners sponsored this black tie evening that took place on April 20, 2013, at Cape Town's Lookout. The award evening was a culmination of a nationwide nomination process, and celebrates contributions to the South African Maritime Industry. The Newcomer award recognizes an organization that has successfully overcome barriers, often limiting new entrants, in the maritime Industry. Chris Magagula Managing Director at Wabona Logistics, who's far from being a novice in the Maritime Industry, has a number of other maritime accolades under his belt. Included among these, is the Department of Transport's Black Owned Maritime Business of the Year Award. Eyethu Ships Agencies won this award in 2004 and 2005, during which time Magagula was the Managing Director. Magagula is also one of the founders of the Maritime Transport & Services Industry BEE Charter. Magagula has maintained involvement with community development and has been instrumental in the launch of the maritime curriculum in JG Zuma High School situated in the Kwa-Bester Township. He also ensured that maritime career awareness, through organizing presentations by top maritime academics and port operation tours for the learners, takes place at the school. Wabona Group took Maritime Studies students of JG Zuma High to visit the Russian Tall ship the STS Pallade that called at the Durban Port, on March 18, 2013 as part of the Russian entourage a week before the BRICS conference. •Investment in Human Capital Award: Smit Amandla and SAMSA. •Seafarer of the Year Award: Knowledge Bhengu, who is currently serving aboard the Department of Environmental Affairs ship the SA AGULHAS II. •Maritime Maestro Award: The award was won by Captain Okke Grapow in acknowledgement of his life time contribution to the development of the SA Maritime Industry. •Maritime Newcomer Award: Wabona Group, headed by Chris Magagula. •Maritime Innovation Award: Aqua-Tech Diving Services. •Learner of the Year Award: Talente Ngema 2012 matriculant, with seven distinctions, from Lawhill Maritime Centre in Simon's Town. •Commitment to CSI Award: Safmarine, for the 21st anniversary of the 'Container for a community project' and its commitment to community development.